The operation of used plastic pulverizers, or mills, is very simple. A serrated grinding disc rotates at a high speed against an identical stationary disc. 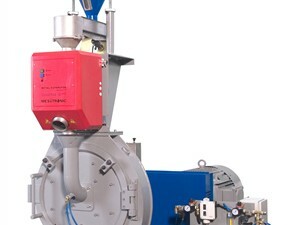 When the plastic product to be reduced is placed in the pulverizer infeed, the size of the origanal product can be reduced to a powder. The size of the final powder can be determined by adjusting the gap between the discs. Arlington's list of current pulverizers is below. Please call if you have any questions or require a quote any items we have in stock. Typical product resins include PVC, PE and PC.